Venice inspired me to travel.Franca’s birthday gift to me had us both walking around in circles through Venetian streets from our hostel door, over the Rialto & down every dead-end street or alleyway. Probably my favourite city to date, I’ve yet to see a city that includes so many attributes of the interests I love most; History, Art, Culture. Even the texture & colours of the streets & buildings inspires me to keep walking to see if there’s more I’ve yet to see. Blues & Greys, I love them all. My favourite colours. Red bricks & tiles. Earthy textures of rooftops & bridges. The water darkened brown of poles in the water, the faded sun-dried planks leading the way to ships & boats over every measure. Here are five of my favourites from our trip to Venice that I love the most. Hopefully you’ll see the vibrancy of Venice in the same rosey way I do. Clearly Venice is a City I Love. Apart from the visuals of the city streets (and canals), there are many other ways to enjoy the city & there’s three that I couldn’t possibly do without. Traghetti – With only four bridges covering the whole length of the Grand Canal, you can easily lose previous time walking in one direction or another for a bridge, or waiting for the water buses. Timesaver? Use a Traghetto. Gondola in shape with (human) engine, this family-run alternative costs as little as €1-1.50 dependent on location & time. Sitting – or standing like the locals – you’ll love to skim across the cities waters, snapping pics & reaching your destination – rapidamente. This great picture from Loretta Hui was better than ours! Cicchetti – Standing in Piazza San Marco? Well from where you’re standing, head to the opposite of the islands. Walk as far as you can & you’ll either come to the Jewish Quarter on one side, or the quarter where the students reside. Here you’ll find cheap, diverse food but the most sacred, tastiest & cheapest amongst them are Cicchetti. 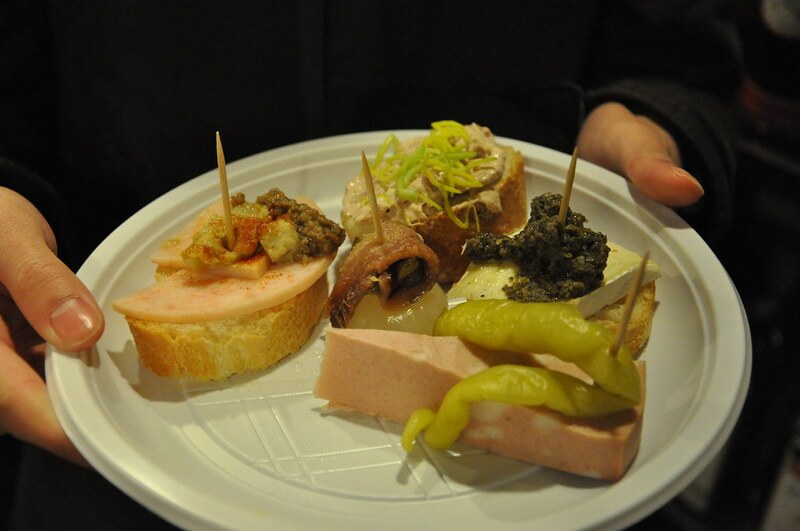 Appetisers comprised of small cuts of salt-free bread (don’t confuse it with staleness) & layered with a selection of meats, fish & vegetables, you’ll be walking back & forth from your seat on the canal-side wall – paper plate in hand – to try another one, or three, or five! Pair this with Venice’s drink of choice – Spritz – and you’ll be localised before you know it. A great piece of art, oh, and that artwork next to Franca too! Which city do YOU love? So here we go, congratulations are in order over here as well!! 🙂 Well done! Thanks Satu, a much deserved well done to you & all of the finalists too! Wow, amazing pictures and cool ideas on what to do! We visit Venice every now and then on our way to Slovenia, as the airport in Venice is the closest one to the Julian Alps in Slovenia. It is great to discover some new ideas on what to do on our day trips, recently we’ve been trying to see the different little islands outside the most touristic ones. And good luck to you too in the competition! We were so undecided about the islands when we were there, but since being back we’re read great posts & seen better pictures than ours showing what we’ve missed. We also love Venice and have had the opportunity to visit on 2 occasions. There is something magical about the city as you stroll the narrow streets and along the canals. Great photos and suggestions! Good luck in the contest! Thanks very much Tracy. I hope to see Venice again & again given the opportunity. Would you go again or would you be more interested in trying somewhere else, like Verona?